When last we left our erratically intrepid heroes, Agent May finally got fed up enough with Coulson’s ridiculous traitor-shaming of her to take her ball and go home. Meanwhile, actual traitor Ward set off on a field trip to gain access to those juicy encrypted S.H.I.E.L.D. files with Skye—the character voted Least Likely to Out-Spy Anyone. In addition to mostly wasting supervillain Blackout, Nerd Champion Patton Oswalt’s Agent Koenig is bumped off. It’s a real downer of an episode—not just in tone, but in overall quality. (Especially following the remarkably strong one-two punch that preceded it. 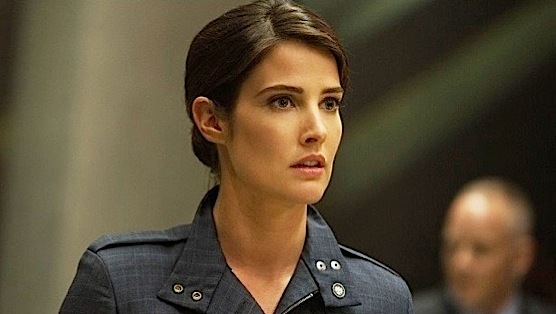 There was, however, a shiny penny dropped by May at the very end, suggesting that Agent Maria Hill (Colbie Smoulders) from The Avengers would turn up. And turn up this week she did. With Col. Talbot. Thanks a Hulk-ton, Maria! Thankfully, he’s far less a problem for our puny agents than he is for Bruce Banner’s invincible green monster. But I digress. After May bafflingly decides the onus is upon her to mend the trust between her and Coulson, she pools intel with Hill in order to obtain the missing pieces to Coulson’s death and rebirth. But Hill’s moved on since the dissolution of S.H.I.E.L.D., having thrown in with the U.S. Armed Forces. While this makes a good deal of sense for anyone under the circumstances, it takes only one conversation with good ol’ Phil to convince her to not only let his team go, but to join them on their pursuit of Ward and Skye. “If I know Skye, she has a plan,” he says, once again exhibiting faith based on no evidence. They beat up the army guys and go about their spy-related business. Meanwhile, Skye enacts her crafty plan, which amounts to simply stalling Ward until she can tip the authorities to their whereabouts. In her defense, it’s less that her “plan” is desperately weak, than it is Ward suddenly began taking stupid pills with an overconfidence chaser. And she would’ve gotten away with it, if it weren’t for that meddling Clairvoyant, and his mangy cyborg! Deathlok makes a welcomed, menacing return in order to remind Ward he’s merely an asset to Garrett, not a necessity. This was a smart choice on behalf of the writers—having not seen him for the past couple weeks, it’s good to be reminded that Garrett is a ruthless, lethal presence, no matter where he actually is. Regardless, Coulson finds Skye on board, and they narrowly escape Deathlok by blowing what has to have been a considerable wad of the season’s budget. Turns out, Phil’s bitchin’ red convertible is a full-on spy car, complete with headlight-mounted machine guns, and Doc Brown’s DeLoreanesque flying aptitude. I was kind of hoping to see Clark Gregg smirk, “Roads? Where we’re going, we don’t need roads,” before pulling down his shades. In any case, it was a nice infusion of fun in an episode that had begun to sag heavily in its middle. In lieu of bigger story and character moments, Agents could certainly use more pure flights of fancy like this. It is, after all, an incredible world they inhabit. Now the rest of the team know Ward is H.Y.D.R.A., and Agent Hill’s seemingly on board. Other than that, there wasn’t much that moved the series forward: Even the big reveal of who ordered Coulson’s T.A.H.I.T.I. procedure didn’t change anything, nor was it very creative. (I’m pretty certain there was an episode of Star Trek: TNG this plot development mirrored heavily.) His recorded confession did point out some side effects, which I’m hoping directly leads to a profuse apology to May and a stunned realization he’s been giving absurd preferential treatment to Skye. We’ll likely never see the latter, but the holes in Coulson’s memory and his often-erratic behavior provide a bridge toward repairing some unfortunate decisions—within the show, I mean. Scott Wold is a Chicago-based freelance writer and regular contributor to Paste. You can follow him on Twitter, if you must.